The applications for this 3D printing process are Concept Parts, Functional Models, Prototypes, Manufacturing Tooling and Molding, End Use Parts. Fused Deposition Modeling (FDM) or Fused Filament Fabrication (FFF) is probably the most popular printing process due to the number of printers available on the market from the 3D Printer Kit versions to the Professional 3D printer (or high-quality 3D printer). 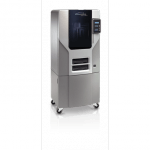 FDM is an affordable 3D printing process versus other 3D printing technologies. FDM is an additive manufacturing process that is great for rapid prototyping concept parts, functional models, manufacturing tooling and molding, and end use parts. This process works by material being melted and extruded through a nozzle to 3D print a cross section of an object each layer at a time. The bed lowers for each new layer and repeats until the object is completed. Layer height determines the quality of the 3D print. Some FDM 3D printers can have two or more print heads that can print in multiple different colors and use support for overhanging areas of a complex 3D print. Support material and rafts are sometimes troublesome to remove cleanly from the object itself. Many different materials exist for this type of printing process. It varies between the industrial versus the consumer version. The most common however are ABS, PLA and polycarbonate. Unlike ABS, PLA is biodegradable and is popular due to it being non-toxic. There is also dissolvable materials such as PVA which are used for support. FDM and SLS technologies are often used for the same kind of printing, if you want to know which one is best suited for your need, have a look to our comparision FDM vs. SLS. One of 4 printers in the Production Series.This is the largest and prints the most materials.